Stylish Old Town holiday apartment in an excellent location, central and quiet. Property 16: Stylish Old Town holiday apartment in an excellent location, central and quiet. Beautiful town house with stunning views of the harbor museum! Property 30: Beautiful town house with stunning views of the harbor museum! The flat was excellent. One thing only did we miss - some heating! Particularly the evenings were unpleasantly chilly, the bathromm too. Germans may be hardy, but not everyone is a German. 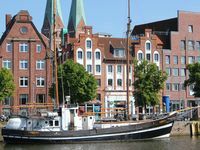 Had a nice visit to Lubeck. 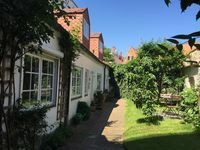 Cute little apartment with private courtyard in heart of city. Nice welcome drink. Janina met us after our drive from Hamburg and showed us around, very friendly. Easy to walk all around old town island. Parking options not too far away and not very expensive. Attended Duckstein festival first day and Drove up to Timmendorfer beach on second day. Would have been nice to stay another day or two.